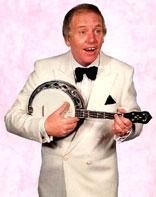 To the public in general Alan was best known for his impersonation of George Formby Jnr. In fact his voice was so perfect that even Formby's fiance, Pat Howson, and members of his family could not tell the difference between Alan and his hero. However, Alan was not just a fine interpreter of Formby he was a brilliantly gifted multi-instrumentalist (piano/drums/trumpet/ trombone/vibes and of course the ukulele banjo). He was also a fine Jazz musician. He began playing at the early age of 4 years and went on to play the vibraphone and piano. It was whilst playing these two instruments at the Windmill, in 1957, he was spotted by the Grades who booked him to tour the country in shows which featured the variety artists of the day and singers such as Tommy Steele and Cliff Richard. His Formby act started in the late 60?s when he had to do a ?front cloth? to allow time for his piano and vibraphone to be taken off stage. These short spots were so popular that agents began booking him for his Formby act rather than as the talented multi-instrumentalist he had begun his career. Alan always regretted that his Formby act had overtaken his ?true talent with vibraphone and piano?. Among the many accolades he received were performances at the Royal Variety Show and tours around the world. In Las Vegas he appeared with Liza Minnelli and Perry Como. He also starred in a musical based on Formby?s life story and co-wrote a biography of Formby with Ray Seaton. Alan was also a tireless worker for Charity and did countless shows for the Water Rats and other organisations. Sadly over the last two years he suffered from Motor Neurone Disease, which finally parted him from Mary, his wife of over 45 years, their two children and a host of friends and admirers.